I just printed the pattern to try! You make it look so easy! I am new to crochet, so I am going to try this. They will work great here on the farm! Thank you and keep up the great work. I love these. I've just printed out a copy and am going to make these when I get my yarn from KnitPicks. Beautiful! I have to learn to crochet! It's denser than knitting, so it's warmer. And happens to be much faster! Sigh! There are so many interesting projects out there! I`m gonna make them when the olympic is over. Wow, those mitts are so great! I Thanks for posting the pattern! These mittens are beautiful!!! Thank you for the pattern. I recently started to crochet again and will definitely try your pattern. very nice pattern. Cant wait to make a pair for my mom for Christmas. The texture combination is wonderful. Hi, Suzetta! I really miss your humor (on the links group). LOVE this pattern...I'll be making lots of these for Christmas. I made these and love them! Thanks for sharing your patterns with us all. 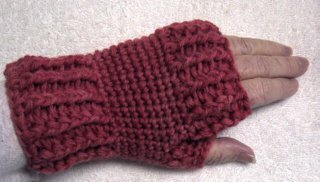 I have already made two pair of these mitts, and I shared your pattern with the ladies in my Thursday morning knit/crochet group. We all love them! One of the women in the group has made three pair in assorted yarns--the pattern works great no matter what yarn is used, and they are fast to make. Thanks againfor your wonderful pattern! Hi :) I searched for an HOUR to find just the perfect fingerless mittens and yours fit the bill! I want to make them for my D for Christmas. All the other patterns I found were SO plain....yours is just terrific. Thanks for shariing it! What a great pattern for my yarn group's charity. We crochet hats, mittens, and scarfs for a local hospital.I think the kids will love this! Many thanks for sharing!! Really nice mitts. Thanks. Can you clarify for me the Medium-Large measurements. It says "measured at knuckles". My knuckles are only 3" across. Am I missing something? I tend to be dense at times! Thank you for the pattern I look forward to making them for my bowling group. It is so cold in the alley and we can wear these and hold the ball! You measure around your knuckles, not just across. I don't understand round 1 of the Optional thumb. Can anyone help me please. I have finished evrything else. You need to sc in each stitch and the side of the sc where you change from the front to the back. I really like this one but it doesn't get cold enough here in the deep south to really need them. This is a great pattern. Love the fingerless mitts. Thanks for a great pattern. I love this pattern but mine doesn't look like yours. My first section doesn't have the ribbing effect. Do have any idea what I am doing wrong? You should get the "ribbing" if you are alternating front and back post stitches. It shows up after the second round. I love the look of these and am getting back into crochet, however I have tried these several times (using the front/back post stitches) and cannot get a ribbed effect, does anyone have any tips or anything because I really want to make these?! Only thing I can think of is you need a little refresher on how to make the post stitches. Search for a video on YouTube and I bet that will help a lot. Thanks, not long after commenting I actually realised there are 2 ways of ribbing crochet, and I was doing one way, however this was the wrong version... I love the pattern though, and my glove is eveloping nicely (I would have been finished by now, but my sc part was too tight and didn't fit my hand without a bit of cut-off blood supply, so I am redoing that part. I LOVE this pattern, Suzette! Thank you for sharing it with us!! It works up so quickly. I've made several pairs as gifts and also for the gals to wear at the office when it is still cold from the weekend. I looked through a bunch of patterns and really liked the simplicity yet attractive design of this one :) Thankyou very much! I used two different shades of pink for mine and made a couple of subtle changes. I'll have to post a link to the picture when I've finished both mitts! Please help a newbie! Having no problem with the post stitches however when I got to the end of round 14 I found I had too many sc stitches. Can you tell me how many sc stitches I should have at the end of round 8? Since there are no increases you should have the same number you started with 26 or 28.